Going to my in-laws is like stepping into pork heaven. I didn't realize what an asset to my swine consumption marrying a Filipino would be, but now that I know, I highly recommend it—or at least befriending a Filipino family, especially around holiday time. My time spent in the muggy days in Houston are filled with tangy crispy fried spare ribs, crunchy pork belly, sweet tocino, tangy longaniza, and so many more gifts from the pig that the Filipinos have worked their magic on. So when looking for new pork adventures for myself, I tend to turn to Filipino dishes for inspiration and guidance. 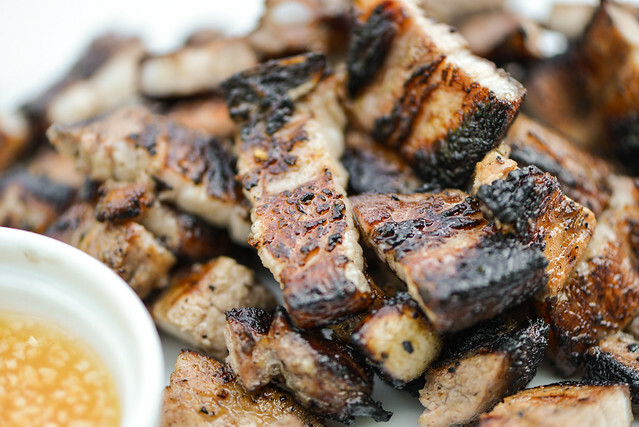 That's how I found Inihaw na liempo—grilled pork belly—which was another win for Filipino pork. My gateway food into Filipino cuisine was chicken adobo. In the early years of dating my wife (a Filipina), the bright red meats, chocolate laden rice, fried pork knuckles, and other traditional dishes served to me were hard pills to swallow as I was trying to navigate a way into liking Filipino food. Back then I was not an adventurous eater, so I needed something familiar enough that I would want to eat, and that came in the form of chicken adobo. This dish is comprised of chicken pieces simmered in a mixture of vinegar, soy sauce, garlic, bay leaf, and black pepper. It's simple, which made it appealing, but also provided a taste of the garlicky and sour flavors that are a common part of the Filipino territory. From that singular dish, I opened up and have embraced the food culture of this Southeast Asian nation. 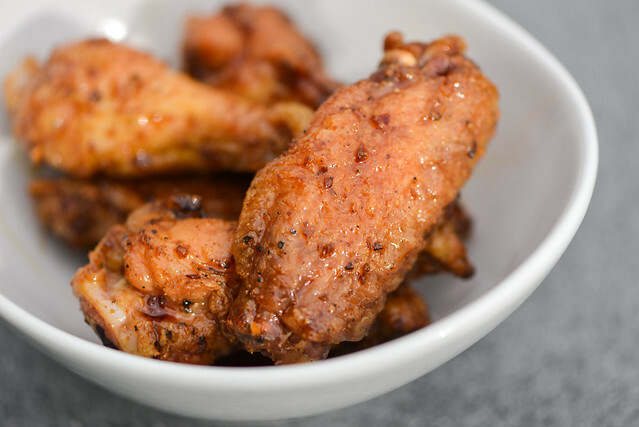 Chicken adobo has actually become one dish I rarely eat anymore—why get flabby chicken when you can have crackling lechon kawali or sweet barbecue—so I thought it was time to get back to a first love and see how I could translate into chicken wings. I think it took a few times for my (now) mother-in-law to coax me out of my food-adverse shell and finally try the bright red meat that commonly adorned the breakfast plates she served back in the days when I was still courting my wife. Luckily it didn't take more than one bite to fall in love this porky delight—sugary sweet, meaty, and filled with delicious slightly soft, slightly chewy fat—and it instantly became a favorite in my morning meaty vernacular. 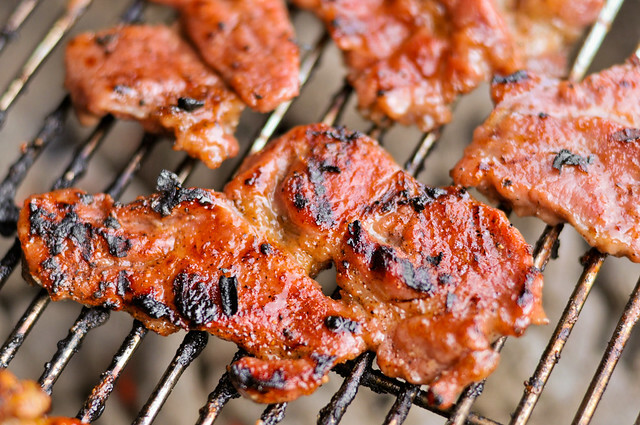 This my friends is the glory of tocino, and I'm hear to spread its good graces to all that will listen. 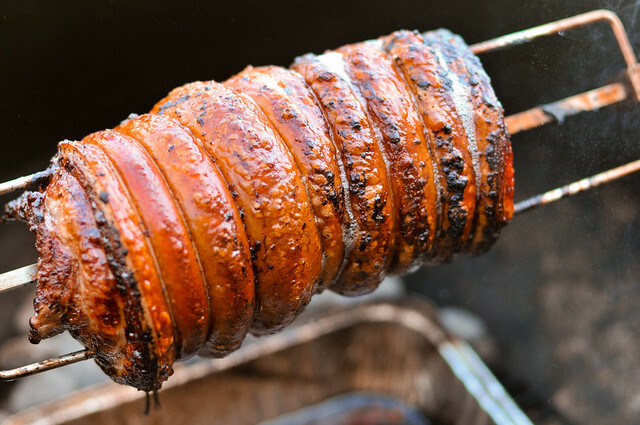 I may talk a barbecue game, but when it comes to cooking swine, Filipinos are at the top of their game. For all the Carolina whole hogs, smoked pork shoulders, and braised bellies I've had, nothing quite matches the simplicity and utter mastery of Filipino lechon—whole roast pig. I'd love nothing more than to learn this fine art of rotisserie swine cooking, but I'm short on a giant rotisserie, hogs, and a mentor. So when wanting to do some Filipino style pork, I took things to a smaller scale and looked to lechon liempo—Filipino roast pork belly. It's a sad time of year, the Meatwave is winding down, with only one left of the season now. To make the most of the time we have left together, I made sure that Penultimeat was a huge porky feast. No one does pork like the Filipinos, so I went to the store, bought a 9lb pork shoulder and divided up into 3 different Filipino treats.